The Government of Catalonia has a new digital tool to spread around the World its arguments for the holding of a referendum on self-determination next November 9th. 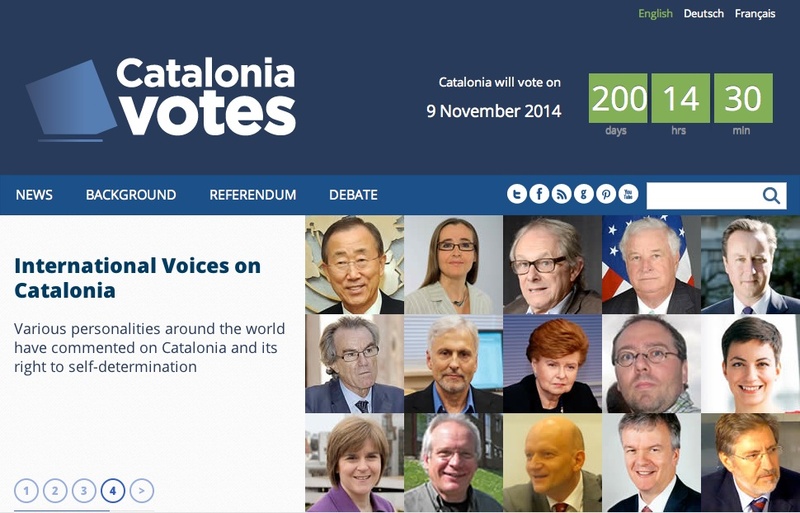 It consists in a multilingual webpage, Cataloniavotes.eu, that includes many posts and links where you can read, for example, a number of internationally recognized individuals supporting it. The new webpage is in English, French and German and will also follow the day-to-day evolution of the referendum process, a consultation vote scheduled for the 9thNovember. It was launched by the Public Diplomacy Council of Catalonia (Diplocat), an organisation backed by the Catalan Government, the four Provincial Councils, universities, chambers of commerce, the main business-owner associations, trade unions, FC Barcelona and other public and private institutions. Two hundred days to go before the date set for the Catalan referendum, the new web page specifically aimed at providing information regarding the 9 November vote, an issue that generates increasing interest at international level. CataloniaVotes.eu offers basic information about Catalonia – statistics and figures as well as information on its history, economy, sport, language and culture. The distinguishing feature of this page, though, is the information regarding the referendum: its process so far, the motives behind it, the stances taken by different actors involved, legal arguments, and so on. All the basic information is available in English, French and German, though some daily updates will only be available in English. Contents of the web page will be renewed daily and subscribers to the page will receive a regular email with updates and news. The information on the referendum includes a section explaining how Catalan society has arrived at the present situation with, for example, information on the non-binding independence ballots held in Catalonia following the example of the town of Arenys de Munt (Greater Barcelona); the huge demonstrations held in Barcelona; and The Catalan Way towards Independence, the “human chain” organized in September 2013. Another section includes opinions regarding the right to self-determination or the specific case of Catalonia made by international figures such as Ban Ki-moon, Secretary General of the United Nations, or the film-maker Ken Loach. Academic studies into the legalities and other issues of the Catalans’ right to self-determination are also available. The section dealing with the referendum focuses on the question itself, the date set, its legal basis, and the consequences of the three possible answers: no, yes/no, or yes/yes. The press section has a wide-reaching selection of institutional news and information, press releases by the Catalan Government and the Public Diplomacy Council, news articles from the international press, and English-language news published in Catalan media as well as opinion articles aimed at international readers. Finally, the web page also offers a selection of short videos designed to make it easier to understand the current Catalan political process. This selection includes a video on recent political events (A nation on the move), another on the right to self-determination (The right to vote) and one explaining the history of Catalonia. There are also videos with messages from Catalan President Artur Mas; the Catalan Finance Minister Andreu Mas-Colell; leaders of trade unions in favour of the referendum; and, representatives from civil society organisations such as Carme Forcadell (from the grassroots pro-independence organisation Catalonia’s National Assembly, ANC), Muriel Casals (from the association promoting Catalan language and culture Òmnium Cultural), Eduardo Reyes (from the association of Spanish speakers supporting independence Súmate) and Jordi Armadans (from the organisation promoting a world in peace Fundació per la Pau), among others.